Merle Haggard, the country music icon who died Wednesday, credited President Ronald Reagan for playing a central role in helping him realize his dreams. “He was a wonderful man in my life. He gave me a second chance at life in the form of the pardon he gave me,” Haggard said in a CMT interview after Reagan’s death in 2004. 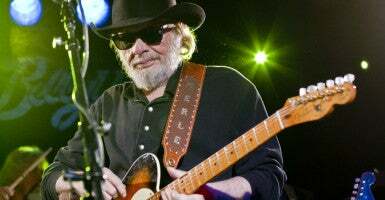 Haggard, an acclaimed songwriter and performer, was a member of the Country Music Hall of Fame and one of the most influential figures in popular music —not just in country circles. Haggard died at home in Northern California on the morning of his 79th birthday, his agent told reporters. Diagnosed with lung cancer in 2008, he had battled pneumonia since December. In 1972, Haggard received a full pardon from Reagan, then governor of California. Officials determined he had been improperly convicted. “God, it meant everything,” Haggard told CMT of Reagan’s decision to grant him the full pardon. Haggard got the opportunity a decade after the pardon to perform for the man who cleared his record, as The New York Times reported in 1982. Reagan had been elected president 16 months earlier, and the occasion was a concert at a ranch adjoining the Reagan ranch in Santa Ynez Valley, Calif.
“I had a chance to thank him personally for the pardon and meet Nancy and have dinner with him. I sat on the right-hand chair next to the president, so I felt really honored. He treated me like royalty,” Haggard said years later in the CMT interview. This article has been modified to correct the location of Haggard’s performance for President Reagan and to reflect the fact that Reagan was quoted through a spokesman.